In a pair of split decisions with lengthy dissents, the California Supreme Court Monday voted 4-3 to decline hearing appeals of lawsuits that challenged teacher protection laws and the state’s level of funding for K-12 education. The decision in Vergara v. California gives a big victory to the state’s teachers unions — the California Teachers Association and the California Federation of Teachers — which sought to preserve the existing tenure, layoff and dismissal laws. It spelled defeat for Students Matter, a small nonprofit organization that sponsored the lawsuit and argued that the laws harmed poor and minority students who were disproportionately saddled with 1 to 3 percent of the state’s worst-performing teachers. The decision in the other case, Campaign for Quality Education v. California and Robles-Wong v. California, two lawsuits that were combined, upholds lower court rulings that found no constitutional basis for challenging the Legislature’s authority to determine what it considers sufficient school funding. That decision was a major defeat for a coalition of state education groups, including the CTA, the state PTA and the California School Boards Association, along with advocates for minority students, led by the nonprofit law firm Public Advocates, which brought the related lawsuits six years ago. They had argued that governors and the Legislature set rigorous academic mandates but then didn’t provide enough funding. Low-income kids and English learners especially were harmed by insufficient resources, they argued. Justices of the California Supreme Court: Standing, from left: Justice Mariano-Florentino Cuéllar, Justice Carol Corrigan, Justice Goodwin Liu, and Justice Leondra Kruger. Seated, from left: Justice Kathryn Werdegar, Chief Justice Tani Cantil-Sakauye, and Justice Ming Chin. A majority of the seven Supreme Court justices must agree to review an appeals court decision. Two of the three dissenting justices in both decisions, Goodwin Liu and Mariano-Florentino Cuéllar, were ardent advocates for the rights of minority children as law professors before Gov. Jerry Brown nominated them to the court. Liu co-authored what later became the state’s current funding system, the Local Control Funding Formula. The third dissenter, Ming Chin, was appointed by Gov. Pete Wilson. Ruling with Chief Justice Tani Cantil-Sakauye in the majority were Justices Carol Corrigan, Kathryn Werdegar and the newest Brown appointee, Leondra Kruger. The Vergara lawsuit in particular drew national attention and spurred similar lawsuits challenging teacher protection laws in Minnesota and New York. The majority of justices didn’t say why they chose not to review rulings by the courts of appeal. Lawsuits involving state education issues generally cannot be appealed to federal courts. However, Theodore Boutrous, lead attorney for Students Matter, said that attorneys were exploring that option or pursuing another lawsuit in state courts. He concluded that the law providing teachers due-process rights after less than two years, known as tenure, laying off teachers based on seniority and making it difficult and expensive to fire teachers combined to create a small set of terrible teachers who were disproportionately assigned to schools with the state’s highest-needs students. In overturning the ruling last year, a three-judge panel of the Second District Court of Appeal, based in Los Angeles, didn’t dispute the worrisome impact on students of lowest-performing teachers but disagreed with Treu that the statutes were to blame. Local administrators make decisions on tenure, dismissal and exceptions to seniority-based layoffs, and the plaintiffs could have sued over how districts administered the laws but chose not to, they wrote. In their dissents, Liu and Cuéllar wrote that the appeals court set too high a threshold in concluding that an identifiable group of student, with common characteristics, had to be harmed – the basis for bringing a challenge involving a fundamental right to an education under the state Constitution. “Difficult as it is to embrace the logic of the appellate court on this issue, it is even more difficult to allow that court’s decision to stay on the books without review in a case of enormous statewide importance,”Cuéllar wrote. Liu found the same faulty reasoning in his colleagues’ decisions not to hear both Vergara and the funding adequacy cases. Both, he wrote, “ultimately present the same basic issue: whether the education clauses of our state Constitution guarantee a minimum level of quality below which our public schools cannot be permitted to fall. This issue is surely one of the most consequential to the future of California.” And they deserved a decision by the Supreme Court, he wrote. “Eliminating teachers’ ability to stand up for their students and robbing school districts of the tools they need to make sound employment decisions was a well-funded but wrong-headed scheme developed by people with no education expertise,” he said. 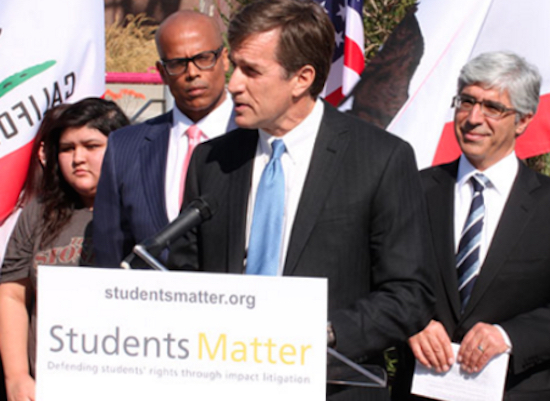 David Welch, founder and funder of Students Matter, said that while disappointed in the decision, the three dissents “speak volumes” about the need to change the disputed laws. He vowed to take the fight to the Legislature so that all students, “regardless of income and zip code,” are taught by effective teachers. Since Vergara was filed, the Legislature defeated several bills, most of them introduced by Republicans, to lengthen tenure and write dismissal and layoff statutes. In June, the Senate Education Committee defeated a bill by Assemblywoman Susan Bonilla, D-Concord, to raise a teacher’s probationary period to three years before granting tenure. It was a diluted version of a sweeping bill that she had earlier proposed. The plaintiffs in the K-12 funding litigation lost in both Superior Court and the San Francisco-based 1st District Court of Appeal. But there was a split decision by the three-judge court of appeal, and Liu refers to the dissent by Associate Justice Stuart Pollak in his own lengthy dissent. As with the Vergara ruling, the four-justice majority didn’t say why they decided to let the appeals court ruling stand. In that ruling, Associate Justice Martin Jenkins acknowledged children’s fundamental right to an education, but, he wrote, the Constitution doesn’t include a requirement for a minimum level of education for schoolchildren or a minimum level of school expenditures. And he indicated that judges shouldn’t presume to have the expertise to set appropriate funding levels. Much has happened since the plaintiffs filed their lawsuits six years ago during an economic recession that led to substantial cuts in school funding. For most districts, funding has been restored to pre-recession levels, and the Legislature adopted the Local Control Funding Formula, based on a paper that Liu co-wrote as a law professor at the University of California, Berkeley School of Law, which provides extra money for low-income students and English learners. But, Liu wrote, student achievement remains low. In the 2015 National Assessment of Educational Progress, California students ranked between 41st and 48th among states in 4th and 8th grade math and reading tests. And, he wrote, the state’s new funding formula redistributes, not increases overall funding. None of the finance and governance reforms “directly addresses the fundamental question of adequacy at the heart of plaintiffs’ complaints,” he noted. “Whether education funding will continue its current upward trajectory remains to be seen,” he wrote. The Vergara case was a distraction from some of the larger reasons behind poor student achievement – segregated neighborhoods and school funding based largely on property taxes. I agree that some of the tenure language should be changed to make it easier to dismiss teachers who are not doing their jobs, yet this lawsuit was an attempt to gut teacher union protections without really solving the problems of educational inequities. I would like to see an article by a legal expert on why lawsuits objecting to the scurrilously low levels of CA’s school funding are not upheld. “Adequacy” has a legal definition as set in prior court cases. That is, is there a discrepancy in the rigor of academic standards mandated by the state for the school to implement and the level of funding provided by the state for the schools to actually implement them? Certainly CA, which has adopted the “world class” Common Core Standards (and the last set of standards were also deemed “world class”), has set a high bar for academic rigor and yet the state still suffers from low funding per pupil compared to the national average, high class sizes, and a shortage of nurses, counselors, and librarians. The discrepancy is there writ large. What is the problem? Most adequacy lawsuits filed in other states have been upheld by those state’s courts. Is it peculiar to CA’s courts, or is there something written in the State Constitution that makes school funding issues unique compared to those other states? The stunning hole in the legal argument of the self-styled “school reformers” against the states laws covering teacher professionalism were the large number of CA school districts that perform at a high level, even by the shallow measure of the last set of state tests, and operate under all the same state statues re teachers that the low performing districts do. The appellate court rightly pointed out that, if there is a problem, it must lie with how the various school management people implement the laws, not the laws themselves. And it is glaringly obvious that the difference between the high performing an low performing districts is the socio-economic differences (not to mention ethnic differences in our increasingly segregated schools) of the students that attend to two types of districts. I could have predicted this outcome. Come to think of it, I did. As a 12 yr. Veteran Teacher in Vallejo, CA, I feel happy for this verdict. It is time to stop blaming teachers!!! I make $65,000 living in the Bay Area with high rents,high gas prices, no affordable housing. Teachers are quitting. San Francisco Unified started with 100 vacancies last week! What is California going to DO to KEEP teachers!!! Stop insulting us! Or we will QUIT! It would be a good thing if certain teachers quit. I don’t know if you’re one of them, Brenda, but I do know that you don’t speak for all of them, most of whom are fine teachers. Quitting would be the appropriate thing to do in many cases when you’re incompetent. It’s better for everyone rather than litigation, failing classrooms and countless ed dollars flushed down the drain pursuing dismissals. The system favors the employees over the clients(students). It is not attacking teachers to say it should be easier than a 6-step multi-year onerous process to fire them. Any group of professionals, any group of human beings, will perform worse if it’s impossible to fire them. You act like every teacher does their honest best but this isn’t true. Some take the maximum allowed number of days off every year. Some show up but do a poor job. Some do well for 30 years, then burn out and perform poorly. Any human works harder if they can earn a bonus for exceptional performance and can be fired for lackluster or negligent performance. Somehow the union has twisted this basic human truth into a brutal attack which victimizes them. This is why I’m voting for Gary Johnson. I could give my vote to Obama because he at least stood against the status quo, the union’s excessive power. He wasn’t perfect. I can’t vote for Hillary after she said in a debate that she trusted Weingarten and the Union to work to make it easier to fire bad teachers. No one deserves a bad teacher. LIFO hurts children. It would hurt any profession. It’s simply human nature. When the cat’s away, the mice will play. This is why communism never worked. The majority of the wealthy Democratic politicians who support this decision put their kids into private schools. That should tell you something. Hillary and Bill, Pelosi, Feinstein, Boxer, Newsom, Rahm Emanuel, Biden. These are the facts, and they are undisputed. No surprise here. No comments either. CTA wisely doesn’t crow about the victory. in the heat of a California August.